It's a comfy, soft shirt, for one. The kind of shirt that hugs you gently and makes you feel relaxed the second that you put it on. This sort of shirt is a wonderful stress release at the end of a horrible day. My son calls these sorts of shirts his "softees", and I think that is an appropriate term. A shirt like that is indeed a comfort in its soft, cottony goodness. This shirt has bacon on it. Not real bacon, of course. That would make the shirt a greasy mess; not comfortable at all, and probably a bit stinky after hanging in your closet for a couple of days. It's just a picture of bacon, but that is enough. I have fond memories of visiting my grandparents on their farm, my grandmother cooking bacon and eggs for my grandpa before he went out into the fields. The smell of the bacon, the sizzle of it in the skillet, would draw me out of bed at the crack of dawn without any complaints or arguments. 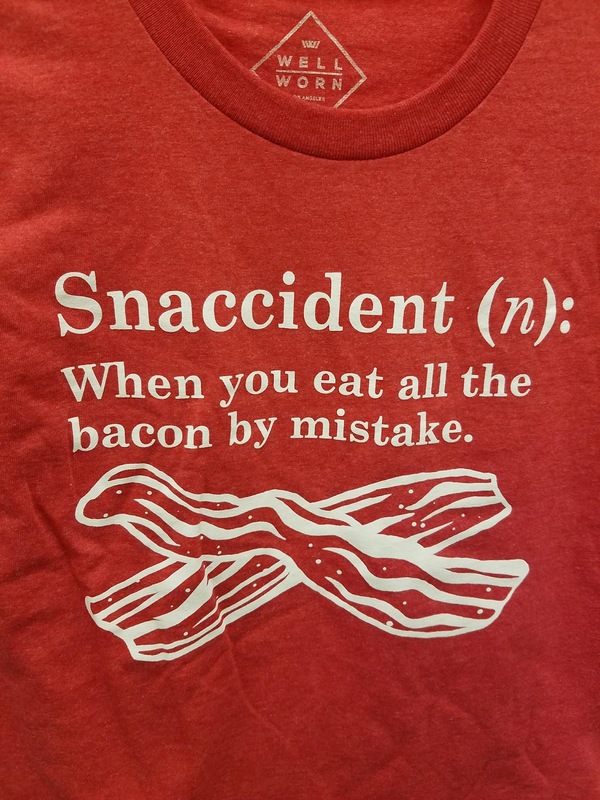 This shirt is marvelous because it has a new word on it: snaccident. This word is what is called a sniglet, 'a word that is not in the dictionary, but should be'. I remember a few sniglets from the 1980s, such as 'margraine'(the headache you get from drinking a frozen margarita too fast), so seeing this word 'snaccident' brings up some pleasant memories. Mostly about the times that I did NOT have a 'margraine'. But I have snaccidents all the time, like when I see an open bag of of those Almond Joy candy bars. Who can resist that wonderful chocolate covered coconut magnificence? However, the words on this shirt imply that a person might eat bacon by mistake. How can this be? Bacon is never a mistake, under any circumstances. Except tofu bacon. That is a crime against humanity. But all the other bacon is never a mistake. Bacon is always delicious, and to think about bacon is a joy for most people, even if they don't eat it. 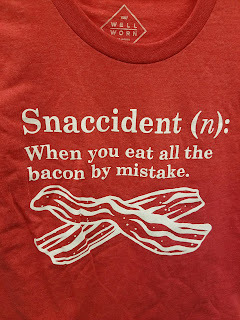 So this shirt should say that bacon is never a mistake, or come up with another food that someone might eat by accident that is not bacon. But then the shirt wouldn't be as great. Not without bacon. Turkey bacon teeters on the edge of being a mistake sometimes, but rarely tips over!